Do you wander around the card aisle at the store looking for just the right card to send to a friend or relative and just can’t seem to find one that suits the occasion? Maybe you like the picture on the front a card you find but the message inside just won’t do. Why not send out a greeting card that fits your sentiment to a “T” and is personally created by you. A customized photo greeting card couldn’t be more personable and unique. Choose just the right photo for the front of your card and add your own text for the perfect message to your loved one. Custom greeting cards are perfect for any occasion, event or holiday and are a thoughtful way to send a little love to someone special. Our double sided cardstock printing option is particularly popular with customers. 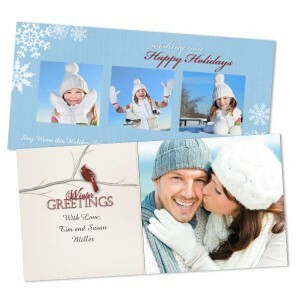 Pick out a template and personalize your greetings with your favorite photos and text. Whether you’re looking for cheap photo cards, or you want to create your own set of professional stationery, MailPix has you covered. Whether you are saying “Happy Birthday” to Mom or just catching up with an old friend, a photo is a great way to liven up your greeting. Photo cards also make a great keepsake that your friends and family can look back on to remind them of a special day or moment in their lives. From seasonal greetings and invitations, to holidays and celebratory milestones, a photo will add a personal touch to make your message all the more special. Have you always wanted to have your very own customized stationery that shows your unique and artistic style? Maybe you want to make your own greeting cards just to keep up with friends and relatives and send out for different occasions. Choose our Custom Photo Card option and let your creativity flow. Add a full bleed photo to the front of your card and your own text if you wish to create the perfect greeting. Leave the other sides of your cards blank so you can handwrite your own message to different friends and family for any event or holiday throughout the year. 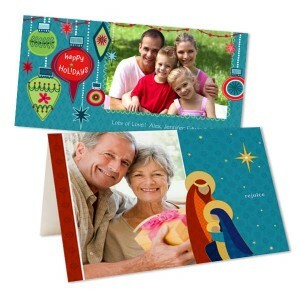 The versatility of a Custom Photo Card makes it the perfect all-purpose greeting that you can send to anyone, anytime. Maybe your friends just threw you a lavish birthday party or a close friend helped you out with your move to your new home. Send them your most heartfelt gratitude with a Custom Photo Thank You Card. Not only will they be pleased with your expression of thanks but will enjoy your added photo as a keepsake that they can enjoy year after year. There is no better way to say thanks personably than with a Photo Thank You Card. Add a distinctive and personal touch to your next party invitation by adding one of your favorite digital images. Invite everyone to your birthday celebration, housewarming party or simply a summertime get-together and compliment your invitational message with one of your most cherished photographic memories. Your prospective guests certainly won’t forget your unique photo invitation and will be thrilled to attend your next celebratory bash. Already selected the day, time and place? Create a Custom Photo Save the Date Card and keep your guests informed with an air of style. Maybe you have already decided on your wedding date. Include your own custom text with your wedding day details and a special photo of yourself with your significant other to create the perfect save the date card. Choose from our many card themes and text fonts to emulate the style of your proposed wedding ceremony or just match your personality. Throughout the years and the 4 seasons, we want to catch up with our relatives and various friends to apprise them of recent events and milestones or just to let them know we are thinking of them. You might want to tell them about the skiing trip you took with your kids over the winter or the hiking trip you enjoyed last autumn. 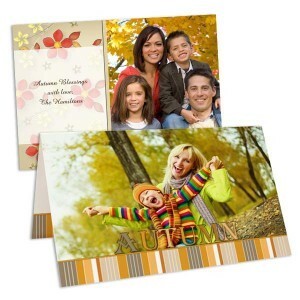 Our Winter, Spring, Summer and Fall Photo Cards make the perfect every day greeting and keep your loved ones posted. Select a fun family snapshot taken in the garden for your Spring Photo Card or your family at the beach for your Summer Photo Card. With several themes and styles to choose from, there is one just right for your next seasonal greeting. From birthdays and anniversaries to a new baby and weddings, there are so many reasons to celebrate the most joyous occasions that life has to offer. Find the perfect picture from your digital image collection and create the perfect card for your next big event. Maybe your parents are celebrating a momentous anniversary this year or your sister is having a special birthday. You can create a custom Birthday Photo Card or Anniversary Photo Card that is perfect for the occasion. Moving is another big milestone that we all do at least once in our lives. Take a photo of yourself and your family in front of your new home and create a beautiful photo Moving Announcement. Apprise your loved ones of your new address and add your own flourishes to make it unique. In addition to moving into a new home, a new baby is also a momentous event that you will want to share with those you care about. Create your own New Baby Announcement and include a photo to make it unique and personal. Your recipients will be thrilled with the great news and will want to keep your baby photo announcement as a keepsake to remind them of the special event. Some occasions like Graduations and Weddings are perfect for not only greeting cards but also announcements and invitations. Maybe your son or daughter is getting ready to graduate from high school and you want to throw a celebratory bash. Our Graduation Cards, Invitations and Announcements let you add a special photo of your grad to make your greeting all the more special. Are you getting ready to tie the knot with the love of your life? Create the perfect Wedding Cards, Invitations and Announcements with you and your love’s best photo to make your greeting truly personal. Choose from a variety of backgrounds and text fonts to match the theme of your wedding. No matter which milestone you or a loved one is celebrating, you can use your own creativity and a special photo to build a Custom Photo Card, Invitation or Announcement that speaks volumes. Throughout the year, there are many holidays and celebrations that allow us to spend quality time with loved ones. 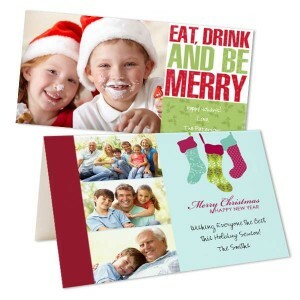 Add a personal touch to any holiday gathering or party with a customized photo card. Send a friend a bright and colorful Easter Photo Card for you best spring time wishes. Or, choose from our selection of fun and spooky Halloween Photo Cards to show off your kids’ elaborate costumes to the grandparents. Show how just much you care with a Valentine’s Day Photo Card, and surprise your love with a beautiful photo and custom message to warm their heart. Looking for a way to make Mom or Dad feel special? Create a stunning Mother’s Day Card or a stately Father’s Day Card and show your parents gratitude for all the times they have been there for you. With a Custom Photo Card, you can not only show your friend or relative some love but also provide them with a cherished photo that they can adore for years to come. From Thanksgiving to New Year’s Day, the Holiday season is a time to enjoy with family and celebrate the festivities. From lighting the Menorah to decorating the Christmas tree, the holidays are full of cherished moments that you will remember for a lifetime. No matter which holiday during the season you celebrate, you can liven up any holiday gathering with a Custom Holiday Photo Card. To kick off the holiday season, create a fun Thanksgiving Photo Card to send a little note to a relative across the country or send one as an invitation to the Thanksgiving dinner you are hosting this year. There is no better time to send a greeting during the holidays than Christmas and Hanukkah. Send out customized Christmas Photo Cards or a Hanukkah Photo Cards to all of your family and friends and show off your favorite family snapshot. After the Christmas and Hanukkah celebrations, ring in the year with a festive New Year’s Photo Card. Make the holiday season brighter with your own photo card creation and share your most prized digital photos with your loved ones. Perhaps you are looking to create the perfect Wedding invitations or simply send your best friend a fun birthday card wishing them all the best on their special day. No matter which occasion or event you are celebrating, you can choose between our variety of card sizes and styles and make a statement with your own creativity. Simply upload your own photos from your phone, computer, Facebook or Instagram accounts and drag and drop your photo onto the front of your card. You can either enter your own text and choose your favorite font style and color, or leave your card blank to handwrite your own special message depending on the occasion. Create a card for a specific celebration or place an order for several photo cards to create your own stationery. There is no better way to express your sentiments with a personal touch than with a beautiful, thoughtful photo card.